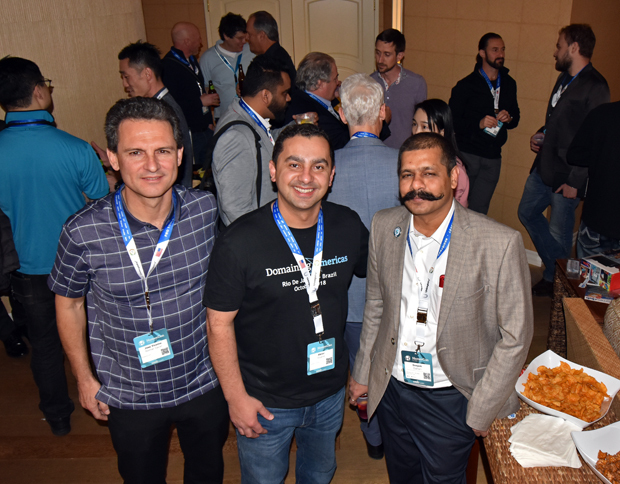 from around the world kicked off with a full slate of business sessions as well as a busy evening of social events. 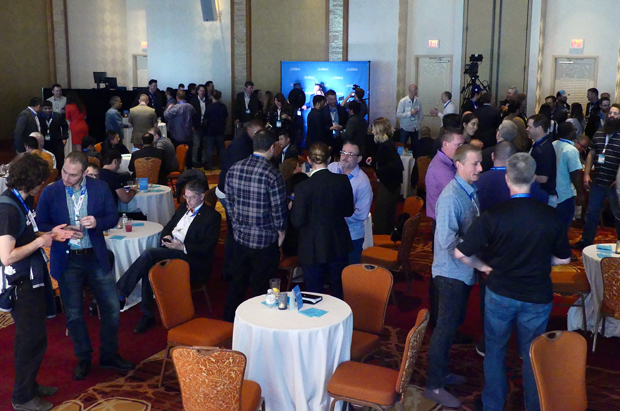 Above: NamesCon Global attendees filled a ballroom at the Tropicana Hotel for the official start of the 2018 conference Sunday morning at 11am. 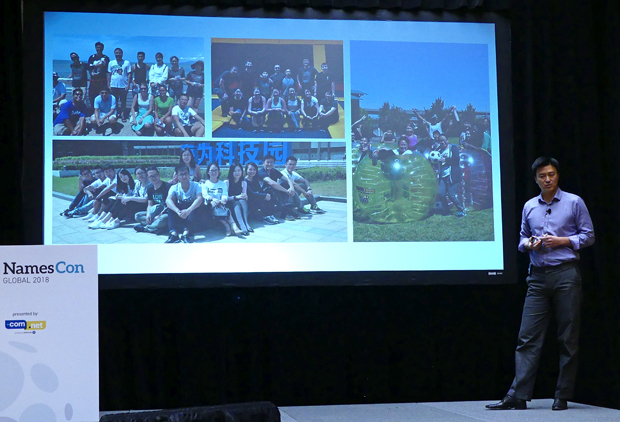 Below: NamesCon President Soeren von Varchmin was on hand to welcome the crowd and he invited a series of special guests to the stage. 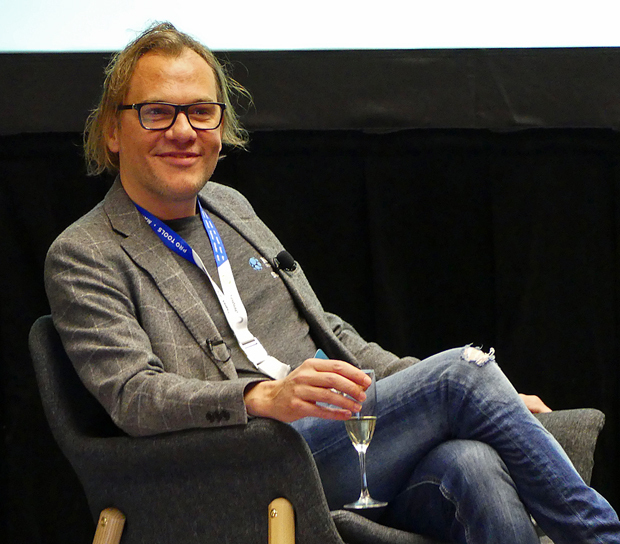 Above: Soeren is also the President of World Hosting Days (now known as Cloudfest) who bought the NamesCon conference from Richard Lau and his partners last year. He invited Richard to join him for a champagne toast and to wish him well with the Water Night fundraiser for the Water School that will be held Monday night (an event that Richard returned to oversee). 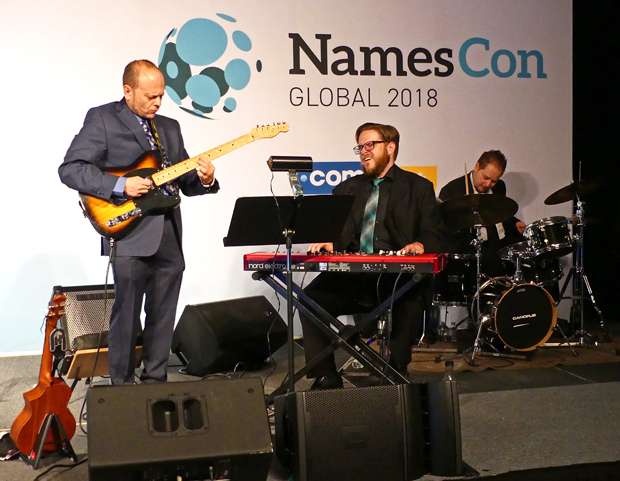 Shortly after this, Richard's NamesCon Co-Founder Jothan Frakes joined them on stage and he was also featured in the day's final business session in his current role as Executive Director of the Domain Name Association (more on that a bit further down). 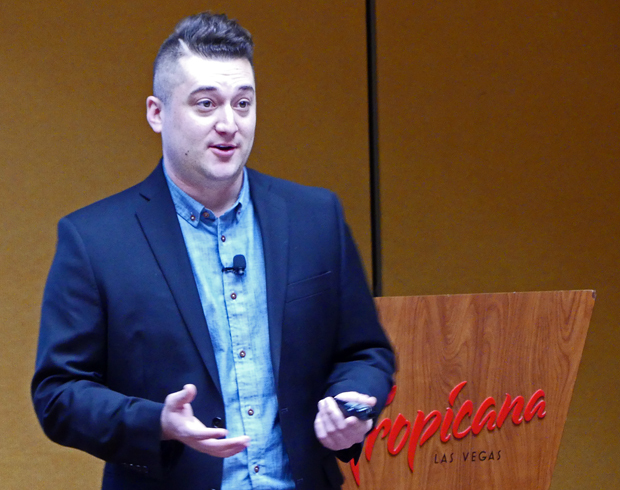 Below: NamesCon debuted a new feaure for their opening day schedule - Tool Talks - a series of 15-20 minute presentations from various service providers and industry experts that ran continuously from Noon to 5pm. The first one featured the founder of popular registrar Dynadot, Todd Han. 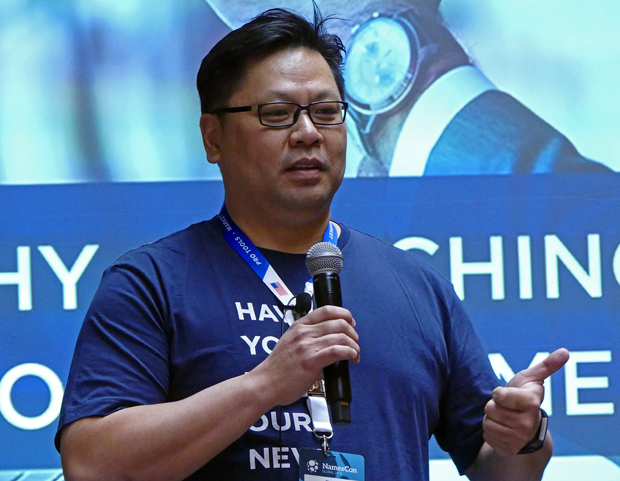 Above: In the next Tool Talk Hexonet's Tony Kim covered the Future of Domain Search - ways registrars can help customers find relevant domain names for their needs. Below: While the Tool Talks continued other sessions were running in an adjacent ballroom. 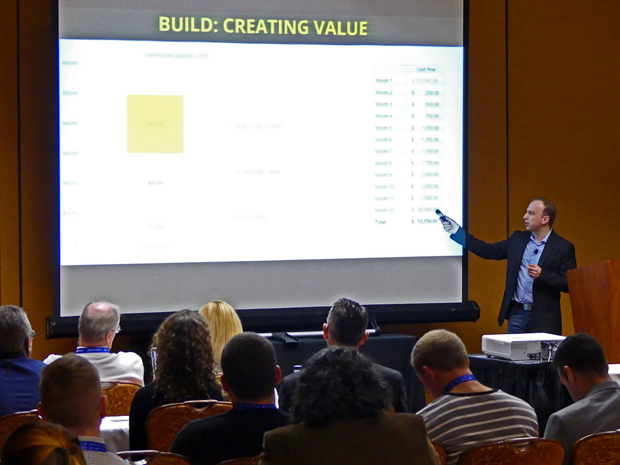 In this one Alex Melen from SmartSites gave attendees tips on Developing a Domain Name and Selling a Business. Above: In another special session after the 1pm lunch break Matt Holmes from Handshakin gave the audience advice on how to Use Your Blog to Connect with Industry Influencers. Below: Next we checked back in at the .GLOBAL stage to see what was happening on the Tool Talks track and caught this presentation on Selling Domains with Confidence Anywhere in the World delivered by Payoneer's Director of Strategic Accounts Brandon Abbey (left) and the company's GM for B2B Services, Scott Reynolds. Above: We stayed in the same room to catch a talk from Morgan Linton (BoldMetrics.com). Morgan gave his Top 10 Tips for Startups Trying to Raise Their Seed Round. 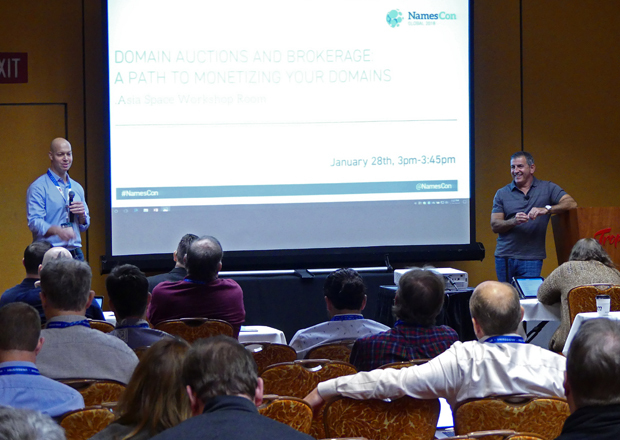 Below: We then headed across the hall to catch what industry veterans Jonathan Tenebaum (NameJet) and Monte Cahn (RightOfTheDot.com) had to say about Domain Auctions and Brokerage: A Path to Monetizing Your Domains. 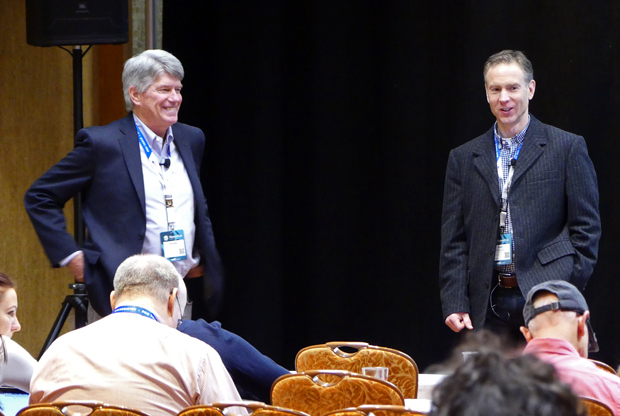 Jonathan and Monte (at right) will run the big NamesCon live domain auction Tuesday afternoon. Above: At 3:40pm we returned to the Tool Talks sessions for an announcement from the .CLUB registry in which they unveiled their new Names.Club. 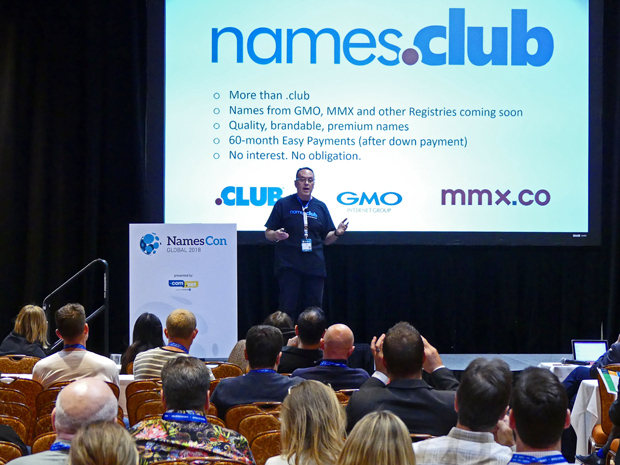 Chief Marketing Officer Jeff Sass detailed the program which makes premium domains from multiple new gTLD registries available with no interest, five year financing. 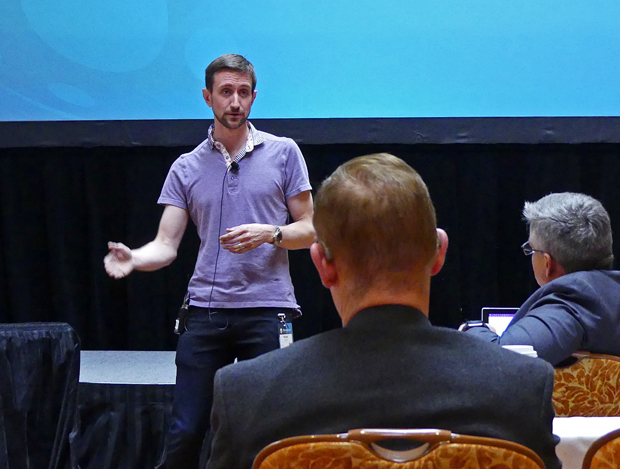 Below: In the final main track session of the day NamesCon Co-Founder Jothan Frakes (who now runs the MERGE! 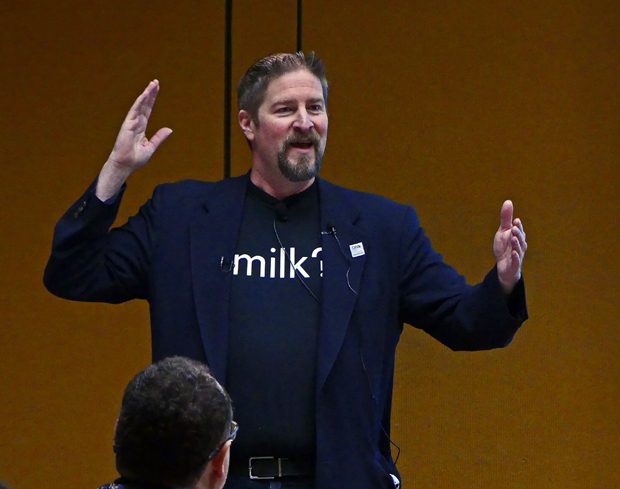 Conference in Florida with Ray Neu) took the stage under a new hat as Executive Director of the Domain Name Association (a role he accepted on an interim basis last fall). Jothan provided details on the benefits of membership and participation in this important industry organization. Above: The next stop may have been the most impressive one of the day. 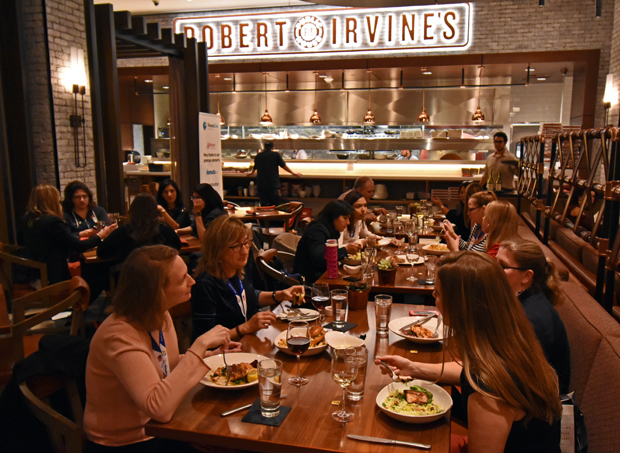 I went over to NamesCon's annual Woman in Domaining Dinner at the new Robert Irvine Public House Restaurant at the Tropicana to snap some photos. 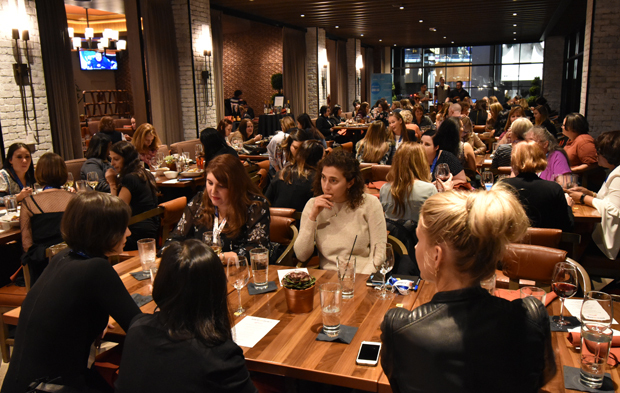 I was stunned by the record turnout of some 120 of the leading ladies in our industry! 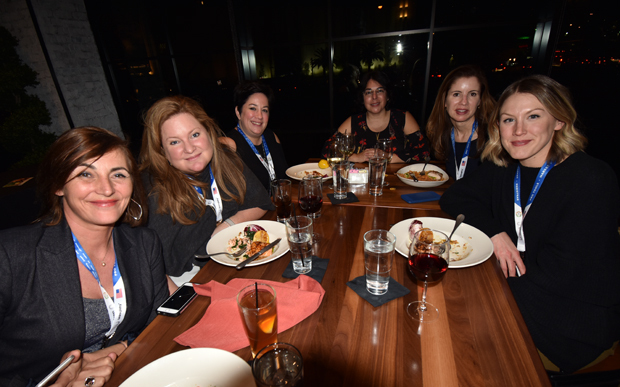 Below: Lisa Box, Vice President Strategic Alliances and Business Development at WP Engine (2nd from left) played a lead role in getting this annual dinner started and it his grown by leaps and bounds every year since. Above: The Woman in Domaining Dinner grew so large this year it overtook two of the biggest sections of the Robert Irvine Public House Restaurant. 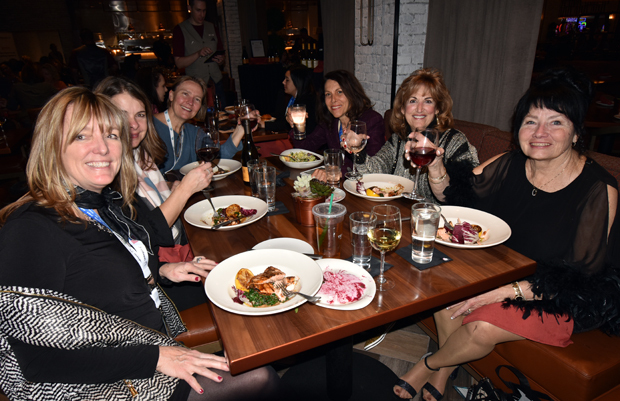 Below: This table was graced by (clockwise from left to right) KW Boswell, Kathy Nielsen, Judith McGarry, Kina Merdinian, Barbara Neu and Diana Jackson. Above: Immediately after the Woman in Domaining Dinner all attendees got back together for NamesCom's big Opening Night Reception at the Tropicana. 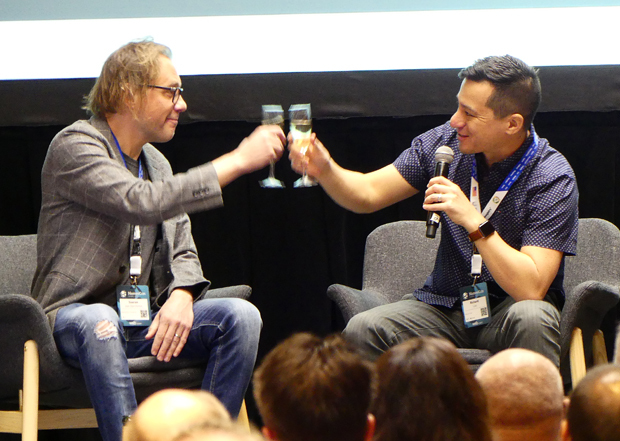 Below: While a jazz trio filled the air with music guests were able to spend the next four hours networking with fellow domain and Internet enthusiasts from around the world. 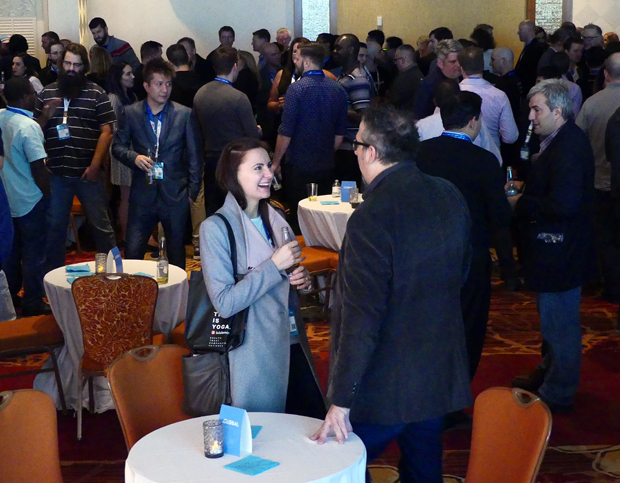 Above: Another scene from the NamesCon Global Opening Night Reception that was sponsored by the .GLOBAL Registry. 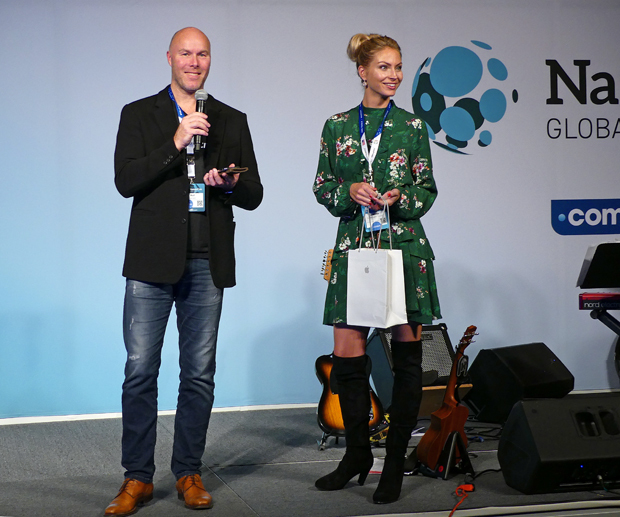 Below: .GLOBAL CEO Rolf Larsen and VP Jeanette Soderlund Sause welcomed guests to the opening night party and also handed out prizes in random drawings. After: As you would expect from a conference called NamesCon Global, guests came from all over the world including a large contingent from India. While originally from India, DNProperty.com's Suresh Raghavan, at far left, has actually lived in the U.S. (Detroit) for the past 20 years, so he didn't have to travel quite as far as his compatriots. Below: Of course, there was no shortage of U.S. natives at the reception either. 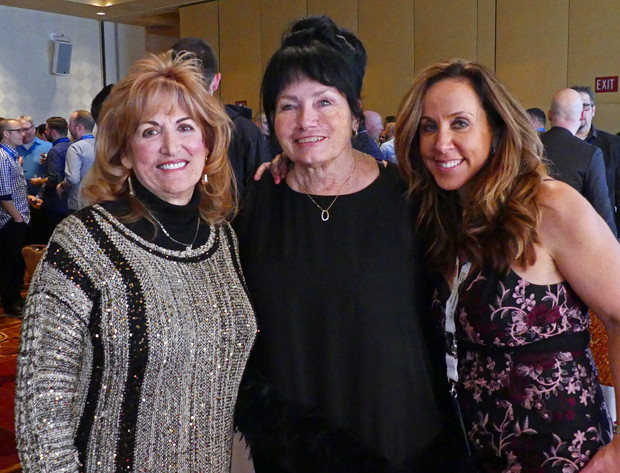 Left to right below are Barbara Neu and Diana Jackson (both from Florida) and Tessa Seelos Holcomb (BrandIT.com) from California. 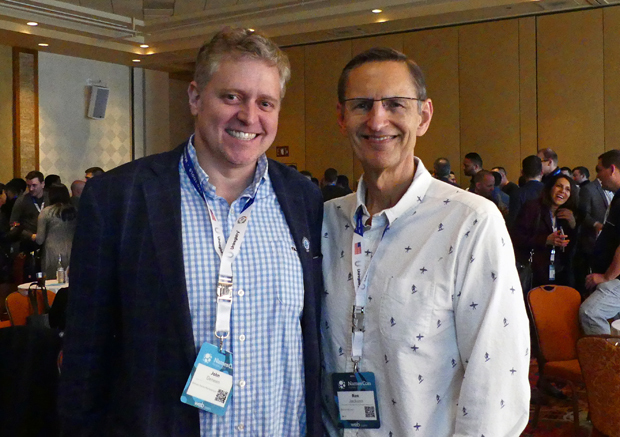 Above: As I noted in a post in our Lowdown section a few days ago, good people are the big attraction for me at NamesCon. One of the old friends I enjoyed catching up with at the opening night reception was Philadelphia based attorney/domain investor/developer John Deneen (left). As I write this Monday's business day 2 is still underway with a full evening still ahead. I'll have all of the Monday highlights for your in my next post from Las Vegas. Copyright 2018 DNJournal.com - an Internet Edge, Inc. company.